A long history of dispute characterized the ownership of the Oregon Territory, which included present-day Oregon, Washington, Idaho, and portions of Montana, Wyoming, and British Columbia. Spain and Russia had surrendered their claims to the region, but the United States and Britain were active claimants in the 19th century's early years. The matter's resolution was delayed by the Anglo-American Convention of 1818, in which both parties agreed to a temporary policy of "joint occupation" of the region. This accommodation was extended in 1827. During the 1830s, the American position came to favor establishment of the northern border along 49º north latitude, arguing that the nation's Manifest Destiny required no less. The British, however, wanted to see the southern boundary of British Columbia established at the Columbia River and based their claims on the Hudson's Bay Company's long history in the area. The British position weakened in the early 1840s as large numbers of numbers of American settlers poured into the disputed area over the Oregon Trail. Possession of Oregon became an issue in the Election of 1844. Democratic candidate James K. Polk took an extreme view by advocating the placement of the border at 54º 40' north latitude. Expansionists chanted, "Fifty-four Forty or Fight!" After the election, Polk put the British on notice that joint occupation would not be extended, but quietly entered into diplomatic discussions. Navigation through the Gulf Islands and the Strait of Juan de Fuca was to be ensured for both nations. 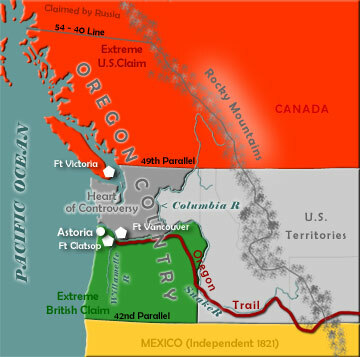 The United States achieved a favorable resolution on the main boundary issue and the British retained full control of Vancouver Island, a matter of prime importance to them. One major point of contention resulted from ambiguous wording in the treaty. It was unclear whether San Juan Island, one of the larger Gulf Islands, belonged to Canada or the U.S. Tensions over this issue peaked in 1859 in the so-called Pig War.